RV’s utilize both 110V (from shore power) and 12V (from internal batteries) electrical power supplies. 12V supplies internal power to the various lights, fans and some appliances in your RV while 110V supplies power to the major appliances or outlets in your RV, such as a refrigerator, microwave or that outlet in the kitchen. When your RV is plugged into shore power the 110V campsite power is stepped down to 12V by running it through a power converter. Conversely 12V is stepped up to 110V by running it through an inverter. Many RV’s have a single unit installed that both converts and inverts as well as charges your batteries. Similar to the breakers in your house, the 110V system in your RV has its own set of breakers while the 12V system has its own set of fuses to control each circuit. If you experience a loss of power to certain components in your RV, such as your roof air(s), microwave, TV or some 110V outlets it is probable that the breaker for the inverter has tripped. Check your circuit panel for a tripped breaker. 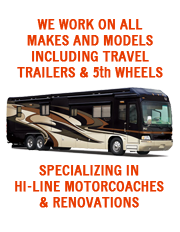 If you experience a loss of power to the lights in your RV it is probable that a fuse has blown. In this instance the fuse will need to be replaced. As always it is important to be extremely cautious when working with any type of electrical system. If you are unsure call or visit an authorized RV repair center to have an RVIA certified RV service technician inspect and repair your issue.